Before departing for Sri Lanka we did a little research into what to bring on our travels, and I must admit that I thought it could be a hard country to pack for. Sri Lanka has diverse landscapes, weather and climates which spread across the whole of the country, from the sunny southern beaches to the cooler mountains in the centre. You've also got to take into consideration that you will be visiting a number of temples and religious locations and need to make sure you conform to any local customs and respects in these areas. So here is my checklist of what I packed which ticked all the boxes and prepared me to travel the most amazing country all in one backpack... under 15 kg! 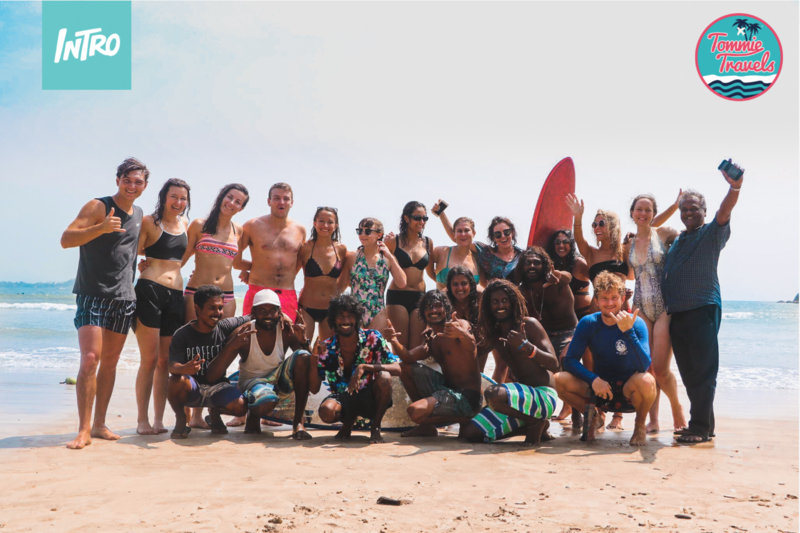 On the second half of the Sri Lanka Experience trip, you spend a number of days relaxing on the beaches, surfing and catching some rays so pack those swimsuits & bikinis as Sri Lanka has some of the most beautiful beaches in the world! Don't forget a small beach towel and/or sarong to chill on as well! You will be taking part in a few hikes and walks on your way to see some incredible views so make sure you bring appropriate footwear! The hikes are not too difficult and only roughly 30 minutes without a steep climb, but you certainly don't want to be doing these in your flip-flops. The views from the top are well worth the short bit of exertion. Here are some of the sights we viewed and walked. Sigiriya - We climbed the viewpoint to witness a great view of Sigiriya. Adams peak - Is another great short hike we did. A lightweight rain jacket will save your life at times! I'm not saying it rains all the time but it is Asia, so you'll have to expect a few downfalls! It's always good to be prepared! Once you leave the coast at Negombo, you'll head into the centre of the country, as you climb higher the air gets milder and the clouds come in so your rain jacket may come out for a cheeky appearance! I always bring a couple pairs of shorts with me, they make up so many different outfits from day to night! Honestly, this is what I wore for the majority of the trip during the day. Leggings, sports tops, vests and shorts are all perfect for Sri Lanka, great for keeping you warm when needed in the cooler parts of the country and when on the train and air-conditioned coach, and then breathable for when you are on the hikes and working up a little bit of a sweat. This is an important one for the trip and it was great that Intro travel provided the whole team with a Sarong. It's important because Sri Lanka holds it's culture and religion in high regard, and covering your shoulders and your knees when in religious areas and temples will show respect throughout the whole of your trip! Bring a jumper - a good tip is to wear it on the plane! This leaves you more weight in your bag and it's always handy to have throughout the trip especially as it can get cold at times, such as the train from Kandy to Ella. It's almost always hot in Sri Lanka so the one jumper will do! I always pack 5 or 6 tops, don't forget to pack tops which will cover your shoulders for when you visit the temples! Always check on the airline's website beforehand for weight restrictions! Sri Lanka has a very chilled nightlife so there is no need to go overboard with evening outfits! Guys, bring one or two nice shirts for the evenings. Ladies, bringing casual clothes and transitioning them to evening wear by adding a bit of jewellery is a good space saving tip! Don't forget your sunscreen, it gets pretty hot and spicy in Sri Lanka and temperatures are fairly constant all year round. So don't be that lobster on day two! Do not let the sun ruin the rest of your trip! A bit of mosquito repellant is a good idea too as they tend to come out in the evening! Before travelling to Sri Lanka you will need to arrange an ETA Visa! It takes no time at all to obtain and at the moment costs around $35 USD but may change! I would recommend doing it before you travel as it saves you having to do it when you arrive at the airport. Of course, don't forget the obvious! Passport, Travel insurance, a Travel adapter (3 pin), Money (Sri Lankan rupee), credit cards... and your SMILE! Ready to start your adventure in Sri Lanka? Check out the Sri Lanka Experience tour here!